If you are someone that ventures out into areas prone to dangerous weather and looking into purchasing an emergency radio, then you may have heard of Specific Area Message Encoding, or SAME. You most certainly are familiar with its importance as well. There’s no doubt that SAME is a lifesaver and crucial for all potentially risky trips out into harsh territory. But what is it exactly? How does it work? Well, that’s exactly what we are going to cover here. The Emergency Alert System (EAS) and NOAA Weather Radio (NWR) in the United States and Canada are encoded by way of specific procedures, and SAME is the protocol used for this purpose. Furthermore, it is also utilized to set off receivers in Mexico City via its alert systems. The long range alert capabilities are one of the fundamentals reasons, in addition to many others, that it is such an invaluable feature. Take an example of being out at sea on your boat. If there is a probable disaster posing a threat, the NWS office broadcasts a warning, as well as a digital SAME code that is heard via the receiver as a short, static sound. This SAME code contains all the information regarding the area or country concerned, or that is already being affected. Thereafter, a warning alarm proceeded by a broadcast message is heard. At the conclusion of the message, another short burst is heard, indicating the end of the message. The NWR broadcasts then resume as before. 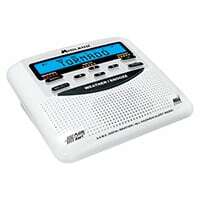 These days, many weather radios contains the SAME alert feature. The advantage with having this addition, is that users are able to set up the SAME codes for their specific area, or other areas that they may be advancing towards. This prevents alerts concerning the whole area from being received by you. There is a multitude of codes used to define a certain weather event. These include warnings for coastal floods, fires, hurricanes and tornadoes. No matter the disaster, you will be well-informed and prepared long before it strikes. It’s troubling to consider the consequences of not having SAME technology. Remember that rescue services do a phenomenal job when it comes to saving the lives of those in need. However, with Specific Area Message Encoding, you can take responsibility for your own life and prevent yourself from ending up in situations that call for rescue missions. SAME thus plays an essential role in bringing you home safety.